RiboCeine™ technology along with ten other essential nutrients to support the cellular production of Adenosine triphosphate (ATP), your cells’ natural energy source and Glutathione, the body’s master anti-oxidant. Unlike energy drinks, there’s no crash or fatigue following a spike in energy. With MaxATP you just feel and perform at your mental and physical peak, from start to finish. 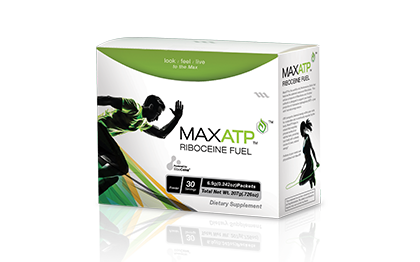 MaxATP™ is a Performance Supplement of nutrient-driven energy powered by RiboCeine. MaxATP’s proprietary ingredients support proper muscle function, the metabolism of carbohydrates, the formation of red blood cells to transport oxygen, and also provides antioxidants. These benefits support the generation and consumption of cellular fuel, giving cells the components to more effectively clean up free radical damage to better assist them in working at their peak level of performance. ATP (adenosine triphosphate) is the basic form of cellular energy for your body and is critically important to the life and health of every cell. As long as ATP is present in sufficient quantity, energy levels are maintained, allowing cells and tissues to function at optimal levels. However, as we age, ATP production can become less efficient. The ATP process requires certain critical elements in order to be manufactured. Numerous vitamins and minerals support both ATP production as well as the process to release the energy stored in food as it goes through the metabolic process. MaxATP provides the critical elements needed for proper ATP function and support. It includes ribose (a precursor to ATP production), as well as other needed vitamins and nutrients to support natural ATP production in the cell. The nutrients that support ATP ensure that cells are able to effectively metabolize energy for longer periods of time. Furthermore, MaxATP provides critical antioxidants needed to help protect cells from free radicals.